This curbside kit faithfully reproduces the 2016 Spa 24 Hours class-winning GT3 M6. 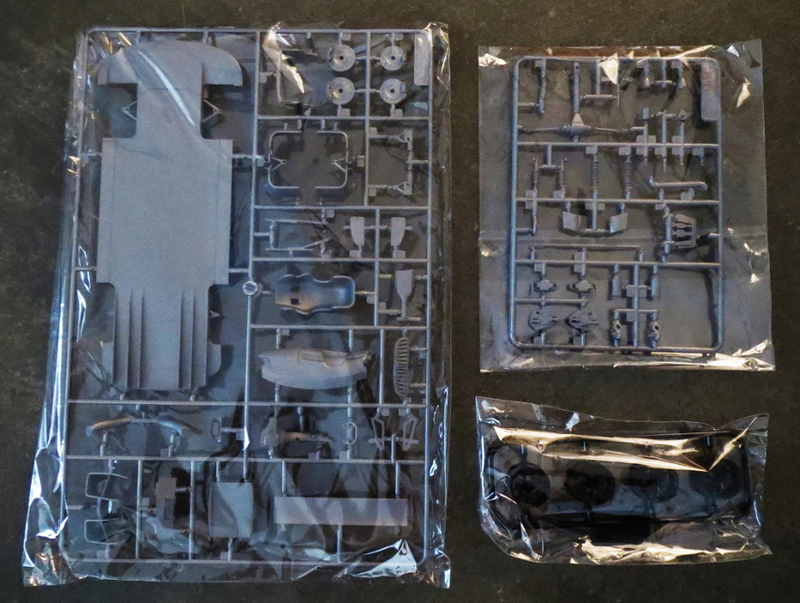 The kit contains two sprues in grey and one each in white, clear, chrome and black. The body is molded in white. Also included are four rubber tires, four poly-caps, two decal sheets and a mesh square. 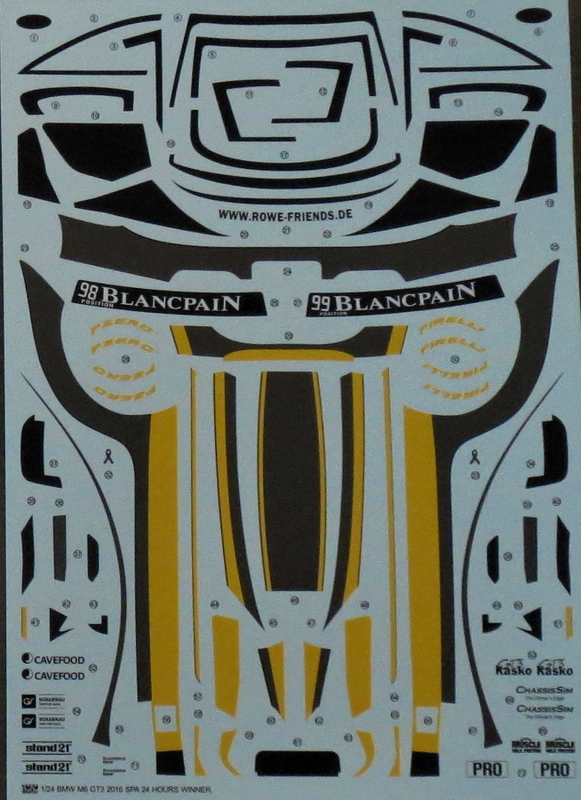 Instructions are clear and concise as far as assembly goes, though the color key provides no English translation. No manufacturer name is given for any of the paint codes, so painting is a bit of a guesswork. I would suggest looking around the Net for reference photos in order to produce the most realistic look in the absence of clear instructions. 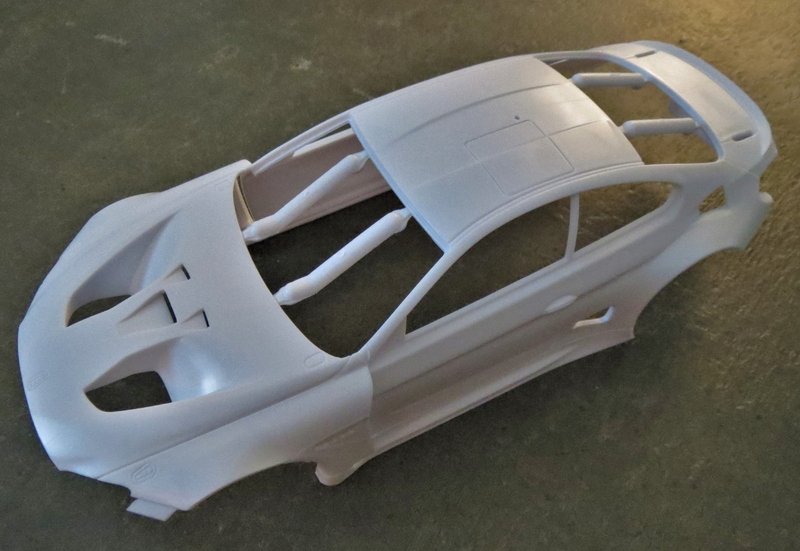 Body is nicely proportioned and looks to scale - it is a very accurate and crisp molding. As this is a curbside model, the interior gets a good dose of detail, particularly in the execution of the roll cage and fuel pipes. There are even door cards built into the sides of the roll cage. There is very nice detail in the radiators and their ducting, unfortunately, most of this will be hidden when the car is completed. I was impressed with NuNu's approach to intelligent location of ejector pins in the molding process. Over the years I've been disappointed with pins leaving their mark on, for example, the reverse side of radiator faces - a pin mark here is a bear to clean up. Here this is not a problem as the ejector pins strike the ends of the sprue closest to the part; the radiators, and most other parts, are free of marks as a result of this approach. That said, there are four large chunks left over from the mold releasing process on the floor pan. They will all require removal before the interior bucket can be attached to the pan. Engraving is good on this part as well, the flat bottom and diffuser strakes well represented. Tires are finely molded with no center ridge. Utilizing black decals to reproduced the window edgings vice using the template/paint route is interesting; I've not used this approach before, so cannot comment on it in any meaningful way, though it does seem a rather fiddly way to do it. 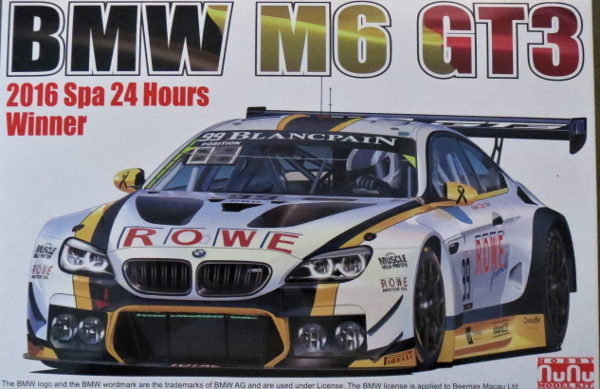 This kit should provide the experienced modeler with a decent challenge and result in a fine representation of the M6 GT3. I would like to thank Platz/NuNu Hobbies for the review sample.